The LightRite UV headlight restoration and repair value pak restores faded and yellowing headlamps to like-new condition. Includes guaranteed lifetime warranty. 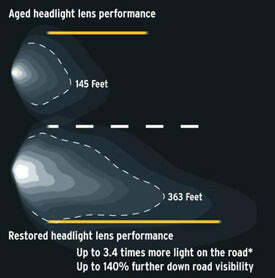 Sunlight can cause immense damage on plastic headlight lenses. Due to oxidation and fogging, the clarity of the lenses are heavily compromised. This can have a negative effect on their ability to emit light. Both DIY hobbyists and full service auto repair shops value the Light Rite headlight restoration repair kits as they are easy to use and highly efficient in repairing and restoring vehicle headlights. This simple value pack is designed to restore headlight clarity and provide a long lasting UV protective clear coat. While enhancing the look of your car, this DIY kit also improves night-time visibility. Hello Michael, in the event the LightRite coating is found to be defective under this warranty, the manufacturer will replace the item. The warranty becomes void if the product is subjected to abuse or improper handling. The LightRite formula has been tested under SAE J2527 2004-02 protocols at major automotive weathering labs. If the coating should ever become cloudy or faded, the product will be replaced; labor cost is not included. It is highly recommended to avoid using a high pressure curing system on the lens. This warranty is also limited to the original purchaser and is not transferrable. This LightRite kit includes a warranty card inside with further instructions and details. Please contact the manufacturer directly for product warranty service.